The American audience gave his Holiness jeans and a t-shirt as a sign of the individualism of the contemporary western world – a gift which is quite inappropriate in itself, but by which they meant no offense, for they did not recognize the poverty of the “American Spirit.” John Paul II, receives the gift with gratitude, stoops down and picks these his children up. With his little game, the Holy Father turns the crowd (what at first looked like the audience of a rock concert) into a Christian community united in prayer. Also in 1979, his Holiness visited the campus of the Catholic University of America in Washington, DC. This man has taught the whole world how to love! 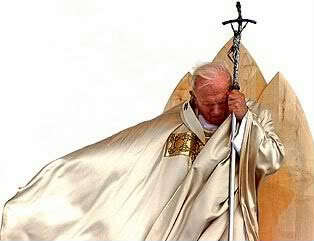 John Paul II: “Dear students, I love you too! … (3:20) Perhaps, I love you more! … No, so I have one with your love. My first greeting on arriving at this campus is for you. (4:10) To all of you, I offer the peace and joy of our Lord Jesus Christ. I am told that you have held an all night prayer vigil … and I have slept! ... And who is loving more? I heard that one of his daily prayers was to ask the Holy Spirit to make him docile to His inspirations. Is this true? Whenever I read negative things about his beatification, I think of photos like this. Thanks.